I love it. I wish we had this in my EE years in mid-seventies. Good job, well done, what a great service you provide for free. I see why the OCW Scholar Diff.Eq. course heaps so much praise on this mathlet. It's utterly excellent. 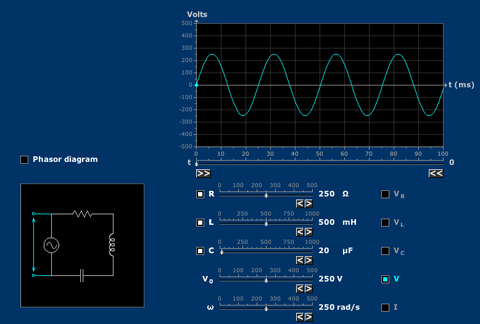 My only negative thought is that as a person learning this stuff, I missed having the impedance visualized somewhere. Trying to explain to myself how everything fit together, i definitely feel I needed to see it alongside the phasors. This mathlet made everything orders of magnitude easier to grasp, making the whole thing tangible. Whoever made it, I greatly appreciate the time and effort you spent. Thank you for this comment, K. I agree. The "impedence" or "complex gain" for systems of this type is displayed in the "Amplitude and Phase" series of Mathlets. There just wasn't room on "Series RLC Circuit" for that representation! We built this one in collaboration with the MIT physics department, for use at a particular moment in their E&M course. Is there any way to change the maximum values of R L C? Marcelo - We tried to offer a reasonably realistic range of values for R, L, C. If you have other applications, it would be interesting to hear them. You can change the voltage amplitude.